Computers have become integral to our work and leisure, but it was not always this way. One person we can thank for the changing, technological tides is Apple co-founder, Steve Wozniak. Since Apple's beginning in 1976, the company has paved the way for personal computers. Wozniak designed the hardware, circuit board, and operating system for the Apple I, a computer that was the launchpad for the company's success. Later, Wozniak developed the first computer with color graphics and BASIC (a high-level programming language) built in. These early successes made Apple a multimillion-dollar business in 1980. After Wozniak left Apple, he completed his bachelor's degree, taught elementary school, and later founded CL 9, the company responsible for the programmable, universal remote. He was inducted into the Inventor's Hall of Fame in 2000. For the next few years, Wozniak worked at several technology companies, even creating a few, before becoming the chief scientist at Primary Data. Although he left Apple, he continues to represent the company in occasional interviews and seminars. Wozniak helped found the Electronic Frontier Foundation, a non-profit group that promotes internet civil liberties. He is the founding sponsor of the Tech Museum, the Silicon Valley Ballet, and the Children's Discovery Museum of San Jose. Wozniak provides the funding and technical support for his local school district in Los Gatos. Throughout his career, Wozniak has received multiple awards, including the National Medal of Technology from Ronald Reagan in 1985, the Global Award of the President of Armenia for Outstanding Contribution to Humanity Through IT, and the New York City Chapter of Young Presidents Organization's 2014 Lifetime Achievement Award, to name a few. Without Wozniak's breakthroughs, our tech-centric world would not be the way it is. 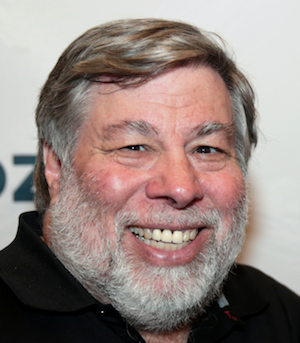 All his continuous contributions to IT have earned him a revered nickname: The Wonderful Wizard of Woz.